Under the View menu select the Names tab. Select the New Item icon on the toolbar or right click and choose New to enter a new name. 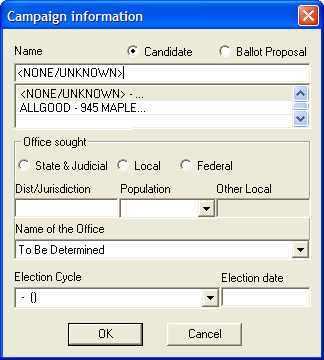 Create a name record for the Candidate Committee showing the full name of the committee. Be sure to select Candidate Committee as the type. Add the committee’s complete address information. Note: If this is for a Ballot Proposal select Ballot Question Committee as the type. Create a separate name record with the Candidate’s first and last name. 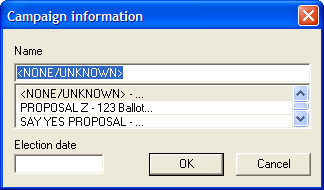 The type must be identified as Candidate in the drop down menu in order for it to show up in the Campaign drop down menu. Note: If this is for a Ballot Proposal add the name of the Proposal and select Ballot Proposal as the type. An election cycle for the committee must be created. To do so, open the Elections Cycle tab under the View menu and add a new election cycle if one has not already been created. Please see the Elections Cycles chart to determine the correct dates. Under the View menu select the Campaigns tab. Select the New Item icon on the toolbar or right click and choose New to enter a new campaign. 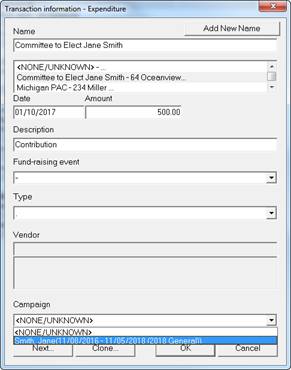 Please note the Candidate�s name or Ballot Proposal must be identified properly in the Names tab to complete a campaign record. (i.e. Smith, Joe must have candidate as his type). Select the required name and continue to add the necessary information. Once the campaign has been created, enter the expenditure by selecting the Summary Page & Data Entry tab. Select the Committee’s Name in which the expenditure is being made. Enter the date, amount and description of the expense. Select OK to accept your entry. Amend the Campaign Statement by opening the Reports tab, right click on the Campaign Statement and select Amend. Complete Steps 1–3 in Before creating Campaign above if the Committee and Candidate names have not been created. If the names have been created and properly identified go to Step 1 in Creating Campaign. Under the View menu selection select the Elections Cycle tab and add a new election cycle if one has not already been created. Close and Upload the amended Campaign Statement. Select Ok to save the entry and close out of the window. Select Cancel to close out of the window. To Modify a campaign record right click on the record and choose modify as shown below. To Delete an existing record right click and choose delete. Please note if the campaign is associated with a report the system will not allow this record to be deleted.